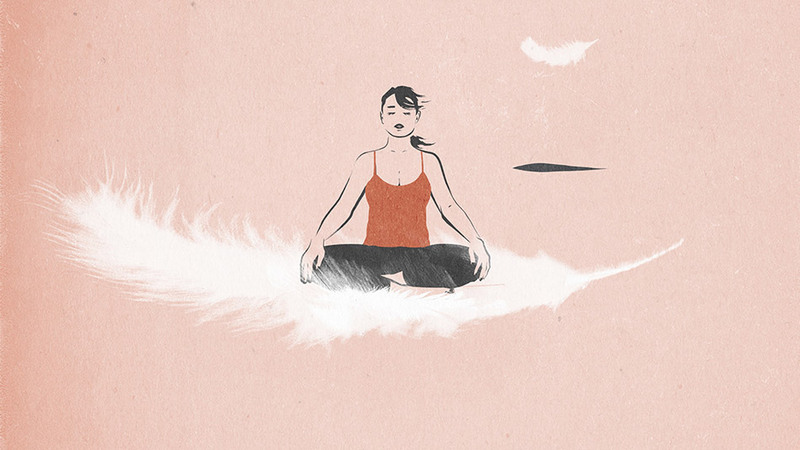 You can choose from a variety of poses in which to meditate. The decision mostly involves whether you want to sit on the floor or on a chair. If you choose to sit on a chair, you will need a straight-backed chair that allows you to sit upright. You will need to cross your legs or put your feet overtop your heels. If you choose to sit on the floor, you will need a cushion that removes the discomfort of the hard surface. You will need to plant your feet directly on the floor. Start by straightening your spine. Straighten your lower spine by contracting your stomach muscles and straighten your upper spine by pulling back your shoulders. Tilt you head forward just slightly. Once your spine is fully aligned, rest your hands comfortably atop your lap or place them into a mudra. You are prepared to begin the practice. Initially, direct your attention to the region of your forehead and nose. Then bring your attention to the inhalation and exhalation. Allow your attention to rest naturally on the movement of the breath in and out of the nose, without forcing anything. After each out-breath, simply wait for the next in-breath to begin. And after each in-breath, simply wait for the next out-breath to begin. Allow the breath to come fast or slow, whatever pace it chooses. But notice how the pace of your breath tends to slow the more you attend to it. Imagine that your breath is an anchor that holds your attention in place. Whenever a distraction arises, such as an uncomfortable thought or feeling, simply return your attention to the breath. Never judge a thought or feeling. Simply allow it to pass or dissolve. Keep returning attention to your breath every time a distraction arises throughout the duration of your practice. Once you have a handle on following your breath and returning attention to it whenever distractions arise, you are ready for the final step. The final step is expanding your awareness to your whole physical environment so that you are fully present and grounded. Notice your whole body in relation to your physical environment. Feel the weight of gravity, as your body rests atop the cushion or chair. Feel your legs and your feet pressing against the floor. Listen to whatever sounds arise from inside or outside the room. Loud sounds, faint sounds, pleasant sounds, unpleasant sounds, all kinds of sounds. Now open your eyes. Before you complete your session, take at least a few moments to remain totally present with your eyes open.